Happy November! 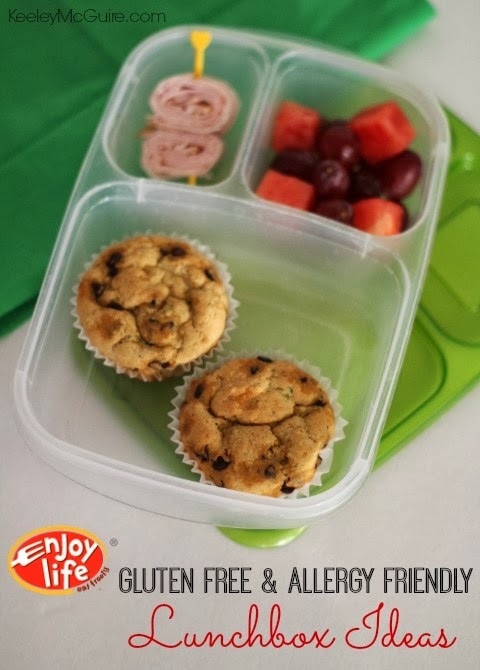 Another month and that means another Enjoy Life Foods Friday! 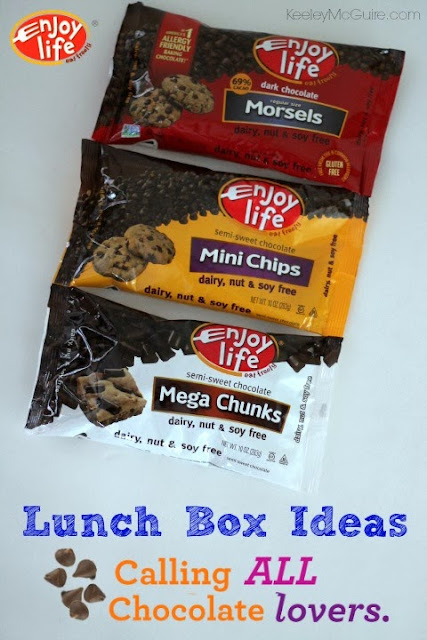 In case you missed our last two segments, each month Enjoy Life Foods has challenged me to come up with lunch box ideas using a certain product. In September the focus was Plentils and in October it was Boom Choco Boom chocolate bars. Let's be honest. The first thing you think of when you have chocolate chips is cookies. I didn't want to share a traditional chocolate chip cookie, because well, I've already posted a recipe for one already on KeeleyMcGuire.com hehe... and this is a challenge! So let's get creative people! I've learned a thing or two packing lunches and baking allergy & gluten free... that chocolate chips > vegetables. Meaning, I can "hide" a veggie in a muffin or cupcake and Little Miss won't care or question it, so long as chocolate is involved. It's true. Don't believe me? Check out our gluten free & allergy friendly Mini Chocolate Chip Zucchini Muffin or Chocolate Beet Cupcake recipes. They're amazing. And Little Miss approved. 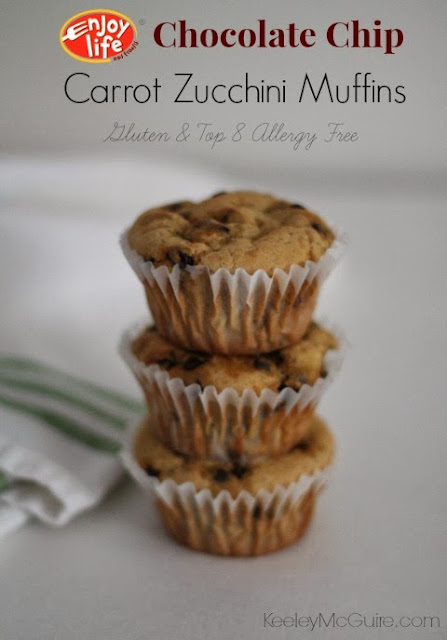 Just like the above mentioned recipes, these Gluten & Top 8 Allergen Free Chocolate Chip Carrot Zucchini Muffins do not disappoint! Printable recipe located at the bottom of this post. They're soft, packed with nutrition from the veggies, and deliciousness thanks to the Enjoy Life Foods Mini Chips. You might be thinking to yourself... carrots and chocolate? Really, Keeley? Yes, really. All you taste is the muffin and the chocolate chips. 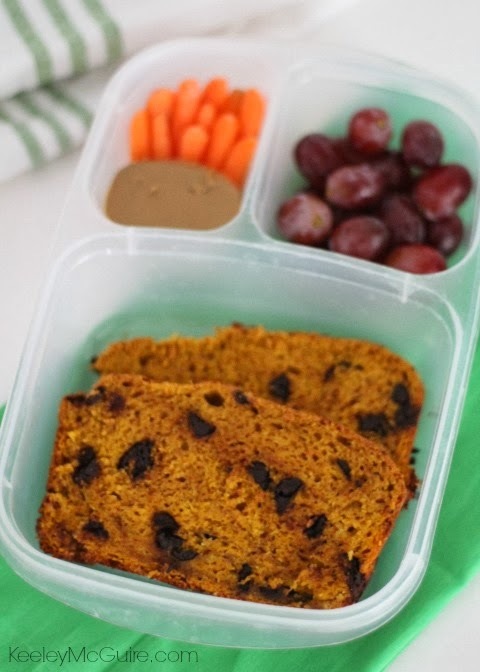 Give it a try: Bake them, pack them up for lunch, or enjoy as an after school snack. Gluten and top 8 free bread... say what!? I know... it's kind of a cheat, because the base is made with King Arthur Flour Gluten Free Bread Mix (which is made in a Top 8 Free facility) but you don't follow the box directions. Follow my directions. Because this bread is ah-mazing. Printable recipe is located at the bottom of this post. I made ours with the new Enjoy Life Foods Dark Chocolate Morsels, but you could really use any of the varieties and it would be equally delicious. I packed it up for lunch with a cup of SunButter gluten & nut free sunflower seed spread on the side. That way Little Miss could dip her carrots in it or spread it on her bread slices. Let's go back. I didn't say this post would be without any cookie recipes. Just not a traditional one. This one happens to be No-Bake. Can I get an AMEN!? 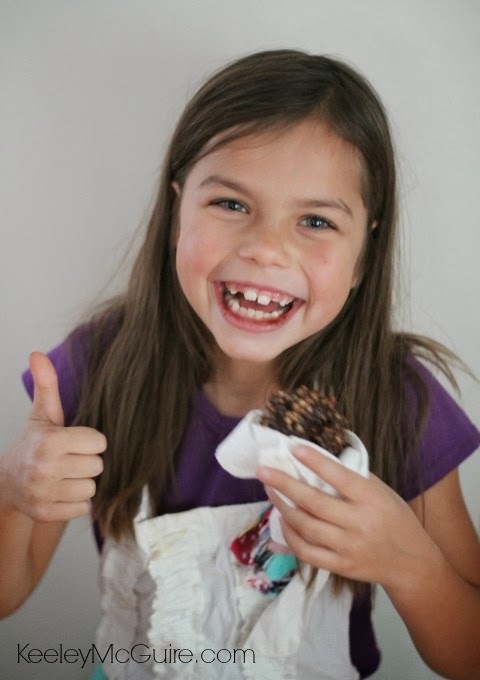 No-Bake recipes are the best for getting the kids involved. It's a great time to let them be the chef and practice their measuring and mixing skills. Little Miss dove right in and helped me whip this one up! Again, I love the adaptability. Any of the baking chips could be used for this one but I recommend the Dark Chocolate Morsels or Mega Chunks purely due to size. And they are fun to sneak bites of along the way. 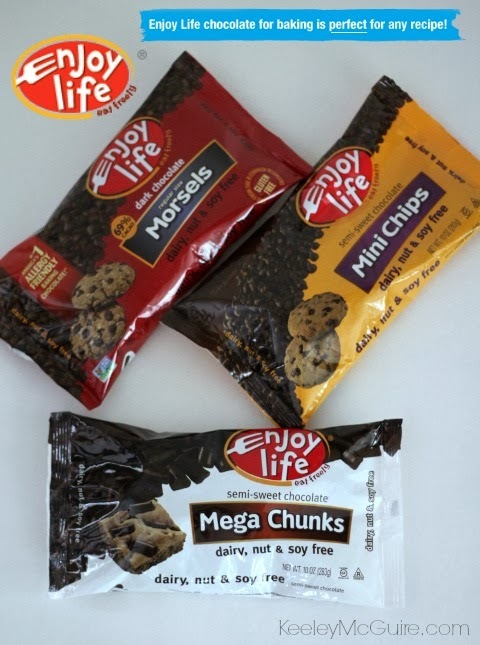 The cookies are made also using Enjoy Life Foods Cereal. If you've never tried their line of cereals, they are - just like everything Enjoy Life does - gluten & top 8 allergen free. They have a Crunchy Rice, Crunchy Flax, and a Crunch Flax with Chia variety. 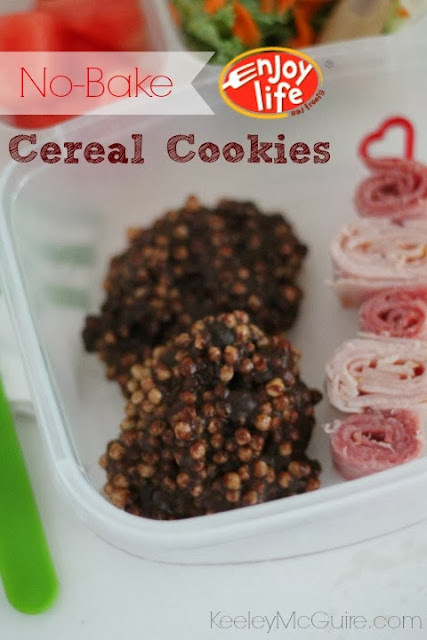 We used the Crunchy Flax with Chia for our cookies pictured above. A delicious whole grain, packed with Omegas & fiber. The kiddos won't know they're getting all the protein and nutrition... they just see a yummy chocolate cookie! Happy chocolate cookie eating child. Better known as "Little Miss", my sous chef. 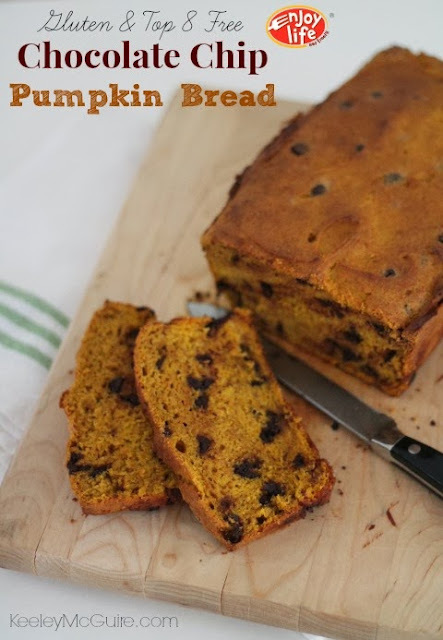 Printable recipe is located at the bottom of this post. What are you waiting for? IT'S CHOCOLATE TIME! What brand of coconut oil do you use? I have avoided buying because I worry about cross contamination with peanut oils, but have seen so many good recipes! I need find a safe brand! Hi Erica, I use Kelapo brand coconut oil. It's fantastic! Thanks!